I started a small Christmas knitting project yesterday. This is the Bend Hat, knit in Dream in Color Special Edition Cashmere Blend Worsted in Black Pearl. The yarn feels great, but it's turning my hands black while I knit, so it's definitely going for a swim in some Synthrapol before gifting or the recipient's head will be black! 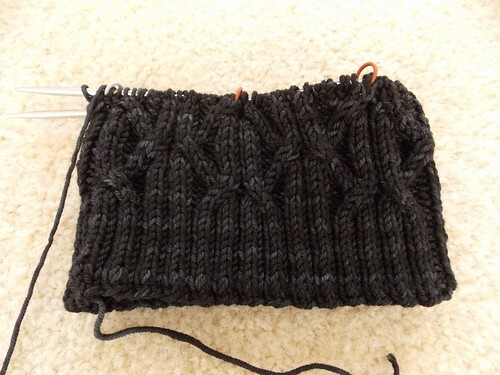 The pattern is fun and has just enough cable interest to keep me amused while I knit a black hat. It should be finished up pretty quickly. Don't you love fast knits? 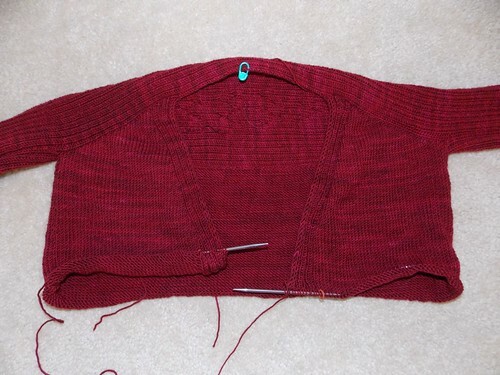 I'm down around waist level on the Retreating Sweater. I don't know for sure how long I'll go on this, but I'll know it when I get there. (I'll just keep trying it on until it looks like it's the right length.) I've got plenty of yarn at this point so I can just keep knitting! November starts Thursday, which means we're approaching the end of the year, which means next year is coming soon. (See how I just skipped over all the Thanksgiving/Christmas/New Year's/Family Birthday craziness there? Yep, still in denial.) That means I'll need to decide if I'm doing a Knit Something of the Month for 2013 at some point. The thing is, my sock drawer is full and my shawl shelves are pretty stuffed too. It occurred to me that I could do cardigans, but I would do one every two months (so six for the year) instead of one a month. I know I've got enough stash yarn upstairs to do this and I'm pretty sure its a doable goal. What do you guys think? 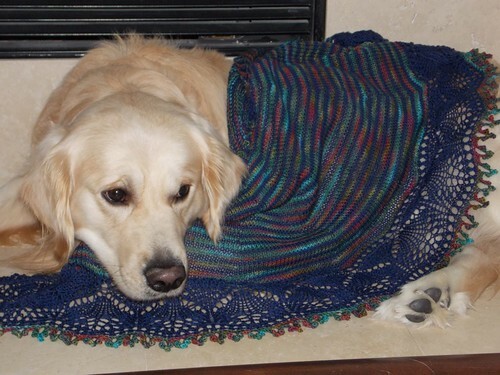 I'm not exactly hurting for sweaters either, but the yarn is up there, waiting to be knit, so I might as well, right? Put a Stake in it, Vlad's done! I finished up Vlad over the weekend! 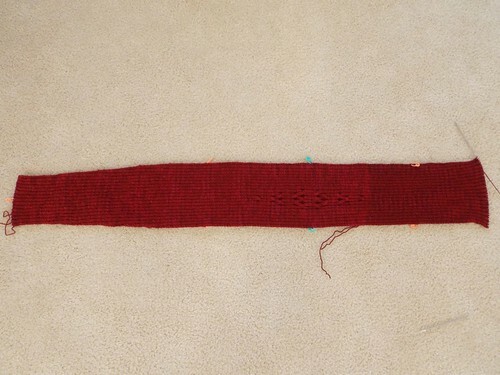 I've still got to weave in the ends and block it, so right now it looks like a shriveled, sad, lumpy thing. I do have a decent amount of yarn left, but I'm happy with the size as it is. Or as it will be after it's blocked! In an only-slightly-related-note, in the past Mickael has had an Impala for work (his job supplies a car for him) and we called it Vlad. I know, that's pretty bad, but it always made us giggle. 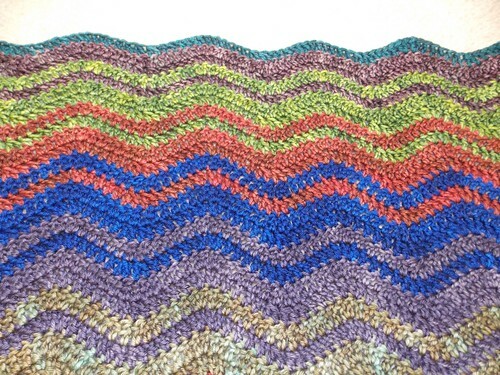 Still working along on the Neat Ripple blanket. I'm past the halfway point now, but not by much. I've been trying to work on this, but I spent most of the day last Saturday crocheting on it and my hands hurt by bedtime that night - oops. I know the weight of the blanket isn't helping me, but crochet apparently uses different muscles than knitting. I'm going to work on it a little every day and then work on something else. It's harder for me to start and stop like that, but I don't like sore hands. I'm not worried about getting it done in time - yet! Logan is getting more and more curious about the morning drop off. He started raising his nose to sniff (I roll down the back windows for him so there are interesting smells) and yesterday and today he was actually standing up a little bit to look out the window! There's still lots of drool, but curiosity is cutting through the anxiety. Someone mentioned a Thundershirt the other day and Logan does have one. It helps him a little and he wears it on longer trips, but for the morning drop off, its such a short ride, I decided to see what we could do without it. I'm happy to see some improvement and we'll keep at it. I've been working on my Vlad and I'm ready to start the edging now! 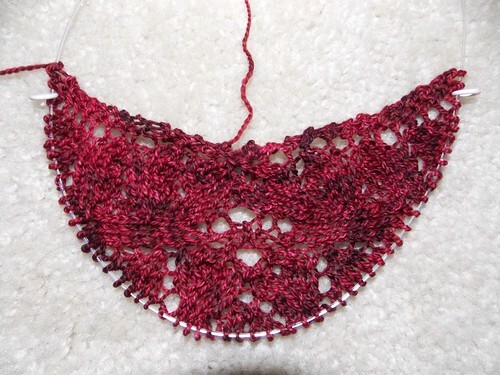 I ended up working two extra repeats of the Body Chart, and I think I've probably got yarn to keep going for another repeat or two but the shawl is going to be plenty big as it is. I've found that if shawls get too big, they're harder to wear (or at least they take too much "management" to wear and often, I just don't feel like fooling around with it), so I tend to grab my medium or small shawls more often. 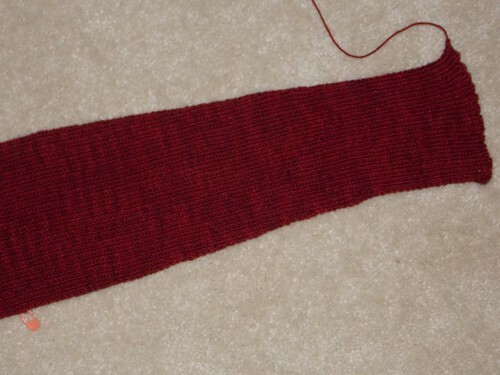 I know it just looks like a red blob right now, but that's what they all look like unblocked, right? We had a bit of a setback yesterday on Logan's morning ride to school. The euphonium fell on him. Somehow it didn't get in the car quite right and when I turned, it fell on the puppy. He's fine, but from the squeaking (Logan squeaks like an R2D2 unit) you'd have thought he was being beaten to death by ducks. He managed to survive and this morning went off without a hitch. He's still drooling, but he's lifting his head and nose up more and more and when Caleb gets out of the car, he stands up to look around. I think curiosity is a good thing and might help with the anxiety issues. Maybe by the time Caleb graduates from High School, Logan will be relaxed in the car! Pictures of this sweater are really cracking me up. Compared to the tiny, skinny sleeves, the body looks enormous! Fortunately, when I try it on, the ribbing of the sleeves opens up to real arm proportions and everything is the right size. 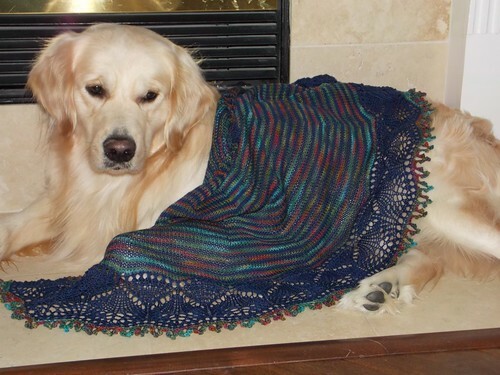 When I'm all done with the knitting, I'll definitely have to get a modeled shot or you'll never believe this thing fits! I've finished up my legwarmers and it's supposed to be cooler again this next weekend! I've got to weave in the ends and I might steam block them (or I'll just wear them and forget about the blocking). These are the Waterlily Leg Warmers (free pattern), knit in Elann's Peruvian Highland Wool in a dark gray heather that appears to be out of stock right now. I did need four skeins, but I didn't use all of the fourth skein. I tried them on as I went so the shaping fits my legs, instead of just following the pattern. The only other change I made was to make the top ribbing twice as long as the pattern calls for so I can either fold it down or scrunch the tops at my knee. This was a quick pattern and easy to do! Oh, just in case, it looks like the bottom legwarmer is a little longer than the top one, it's not - the top one has been stretched sideways some which made it look smaller. It gave me a little scare this morning because I hadn't compared them side by side, but the bottom legwarmer is the second one I made and that one hadn't been tried on yet. They are the same size. 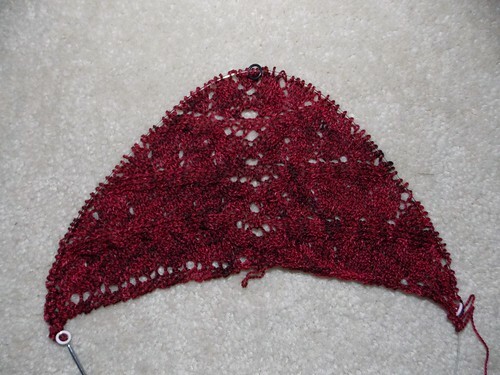 I realized earlier this week that I hadn't blocked my September Knit Something of the Month, Cladonia. Here it is, all blocked and finished, with our favorite model. This is the Cladonia pattern, knit as written, with Socks That Rock Lightweight in Maia and The Loopy Solids Series in Navy. I chose the Navy to pair with the Maia because there isn't any navy in the Maia, but all the colors work with navy. 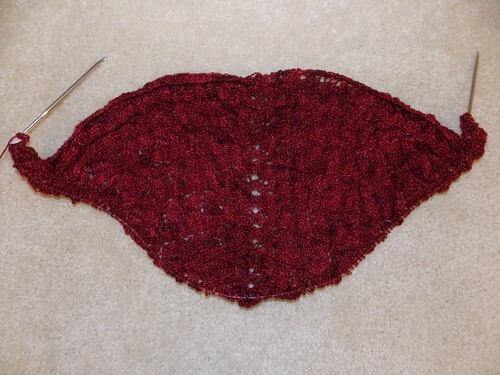 I'm really happy with how this turned out and I think it will be a good shawl to wear this Fall. Today is actually cool enough to need a little wrap! Have a great weekend! I've been working on my Retreating Sweater some more. I'm using two skeins of yarn at once to avoid any color weirdness issues with the yarn being handdyed. I'm changing yarns at the right underarm on wrong side rows, twisting them together to avoid holes. I think it's probably the same technique as intarsia, but I'm using the same color instead of changing colors. 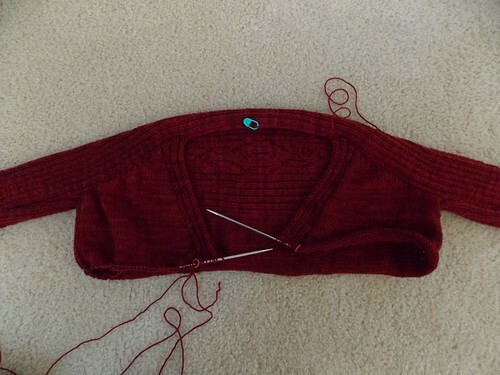 The reason I'm doing the yarn change at the underarm instead of one of the front edges is because the front edges are being finished as I go, so there's no good place to hide the yarn changes there. If I had to come back later and pick up for front bands, I would change yarns at the front edge. One thing I've noticed about this project is that it is really a magnet for pet hair. Having white critters, the dark red really shows off the fuzz. I can tell the lint brush will be getting a workout! Or at least, I'm getting more leg-warmer! I know, that was bad wasn't it? Maybe I should just stick to knitting. I finished the first leg warmer and I'm making progress on the second one. I did a lot of ribbing at the top (more than the pattern calls for) so I could turn it down and make a cuff. I thought that would look better at the top of my boots. I figure if I'm wearing them over leggings I can either cuff them or just scrunch the tops at the knee. 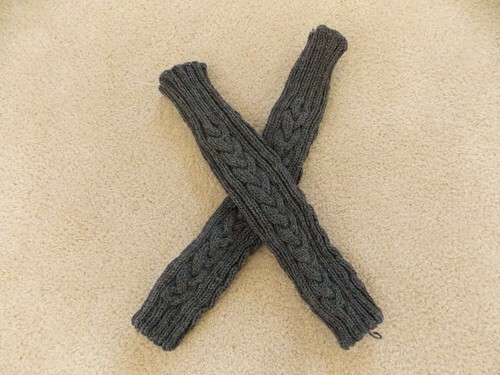 This is an easy pattern to knit and wouldn't be a bad way to learn cables either. Just to recap, these are the Waterlily leg warmers - free pattern! 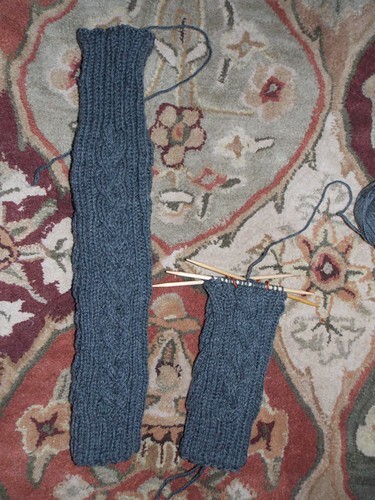 There's a lot of ribbing between the cables (do you know how many times I've typed Caleb instead of cable?) that should make them fit a variety of leg shapes and sizes. Whenever we have another cold snap, I'll be ready for it! I've been working along on my Vlad. According to the pattern, I'm ready to start the edging, but I have almost 200 yards more than the pattern calls for, so I'm going to work an extra repeat or two of the main pattern before I start the edging. I really have nothing more to add here. I think I'm going to need more caffeine today because I'm sitting here, staring off into space, doing absolutely nothing. It's going to be a long day if the caffeine doesn't help! Guess what? Do you see that blue green (Norway Spruce) at the top? 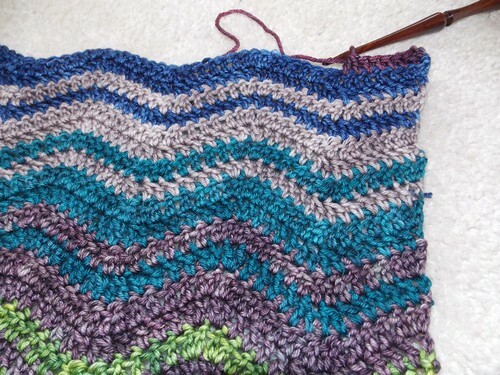 Once I've completed the stripes in that color, I start repeating colors. In other words, I'm right at the halfway point! I still plan to get this finished in time for Christmas and when I actually sit down with it, I make pretty good progress. I'm crocheting in the ends as I go so other than trimming them down, there's not going to be any extra finishing to this blanket when it's done. I'm not going to work the second half of the blanket in the same order as the first half and I might actually plan it out ahead of time, just to make sure I don't end up with a big pile of brown in one area. That will also make the crochet go a little faster if I don't have to stop and think about what color to use next. I'm loving the size and feel of the blanket so far. So yesterday I spoke about my own reaction to the chilly weather over the weekend, but I wasn't the only one affected by it. Caleb and Max were fine - I tossed an extra blanket over Caleb at night and Max sleeps under the covers plastered up against me. Logan seemed a little cold the first night the temperature dropped. He didn't just relax and go to sleep, there was a lot of moving around and shaking out his fur (he does that when he comes inside from the cold and I think he's shaking the cold out of his fur). I put a blanket on him and he settled down and slept just fine the other two cold nights we had. Clearly, the pup was a bit chilled. Let me backtrack and explain a little bit here. When Logan came into our family, we had Finn's bed, which Logan would occasionally sleep on, but more often, he would use it practice his origami skills. He folded it so many different directions that it was no longer a flat, sleepable shape. 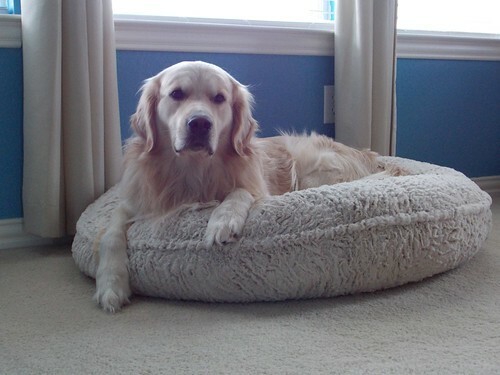 Finally, it was no longer a bed at all but a failed doggy craft project, so we tossed it - there was no fixing it. I decided to wait until he matured a bit before we got him a new bed. Also, he had that crazy, thick Canadian coat and laughed in the face of winter - usually with me at the other end of his leash, freezing to death. Last winter really wasn't winter at all (all the bugs survived), so he didn't really need a bed, and I decided to give him another year to mature. After the weekend of chilly dog, I decided it was time to get Logan a new bed. The new bed doesn't lend itself to origami, but it's perfect for curling up and snuggling down into. Logan seemed very happy with it and likes the way it fits him. He can either curl up, or flop out of it a bit and has taken naps both ways. He usually lies in it in the evenings and right when we go to bed, but moves around to the carpet and the tiled bathroom floor as well (the temps are more normal for the season right now, so he isn't chilled at night). He was very excited to get it and I think he really likes it and I'd bet he'll stay in it all night when the nights get cooler again. Unfortunately, he isn't the only one who likes it. 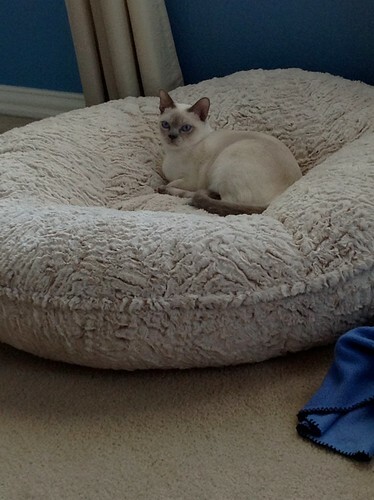 Max thinks its perfect and can't believe we found him a bed that is just the right size for him and his enormous personality. We talked briefly about getting Max a smaller one, but knowing Max, he'd still use the big one and Logan would be cramming himself into the smaller one. Max uses it during the day and he will get out of it if Logan walks over to it. (I think this is more due to the fact that they wrestled in it once and Max got himself cornered in the squishy sides than due to any respect Max has for Logan.) As long as they share it nicely I don't have a problem with them having a communal bed. It's kind of cute that they're sharing it. For the last few weeks (probably a little after Camp Loopy and the Olympics) I've had startitis. I'm enjoying my current projects, but I want to start something new. Several somethings new. I've held it off pretty well so far because I know that if I have too many things going at once, I don't get anything done on any of them and then I get sick of them. I've learned from this mistake before. But the startitis has been there, lurking in the back of my brain, finding cute, fun patterns to work up. It's even gotten smart - it's finding small projects, that would work up really quickly. So quickly, I wouldn't even really slow down on my other projects. This weekend, I caved and started something small and new. Let me begin by saying that this weekend was freakishly cold for Texas. When I woke up Monday morning to go run, it was only 36 degrees. I had to pull on my fuzzy running tights in October! That just doesn't happen around here. So basically all weekend I was cold. When I get cold, I'm not happy, and I want to be warm. Normal people put on an extra jacket or mittens or something. 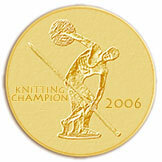 Knitters cast on. So I did. I decided I needed leg warmers, so I found a pattern, went stash diving and cast on. I feel warmer already. (Also, the temp has come up a lot since Monday morning.) These are the Waterlily Legwarmers, knit in Elann's Peruvian Highland Wool in color 402, Oxford Gray Heather. I'm trying them on as I go because I'm hoping they'll fit right and won't fall down. I plan on wearing them over leggings or peeking out of my boots. This is the first one and I'm just about to start the top ribbing. I've taken notes so I won't have to stop and try the second one on so much, I can just knit. 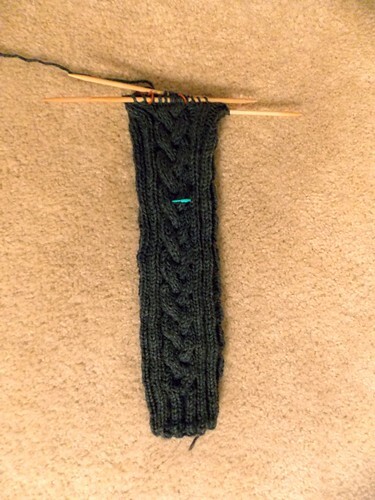 The shaping in these is done with ribbing in the stitch pattern and changing needle sizes. You can try them on as you go though and get the shaping to match your particular legs, increasing the odds they'll stay up. At least that's what I'm telling myself. My Retreating Sweater that is. Over the weekend I seamed the sleeves, tried it on (Yeah! It fits! 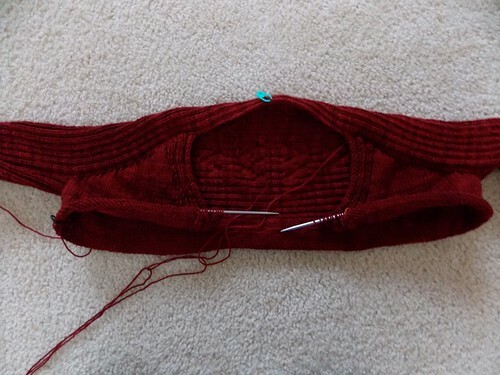 ), picked up stitches around the lower edge, did some math, figured out that if I knit to the pattern's gauge I'd have a ranch house, switched needles for a smaller gauge, knit the short row fronts, tried it on (Yes! It still fits! ), and now I'm working back and forth, down towards the lower edge. Yes, it was a busy weekend. Most of the time if you don't get gauge, using a different gauge means reworking all the maths. This pattern is more of a recipe that you follow than a regular pattern and you work the maths out as you go. (For those of you who get a little queasy thinking about it, the pattern is very well written and she explains everything step by step. As long as your 11 year old measures you correctly - mine did - you'll be fine.) Since I'm using handdyed yarn, I am working from two balls of yarn at once, changing balls every two rows. 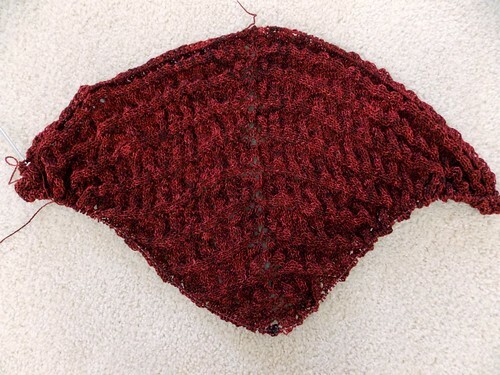 The front edge is finished as you knit, and I didn't want to change balls there and risk making it look messy, so I'm changing in one of the underarm/side seam areas. I've read through the rest of the directions and I think I'm through the most difficult part. 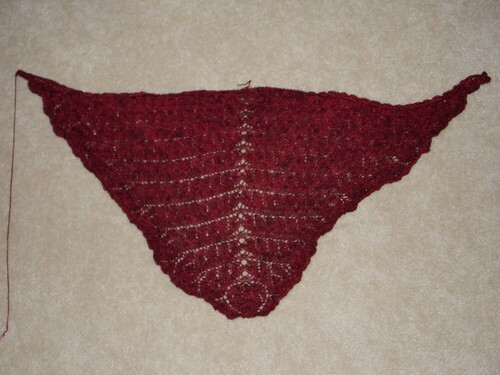 There's a bit of shaping, but for the most part, I'll just knit and try it on periodically until I decide I'm done! 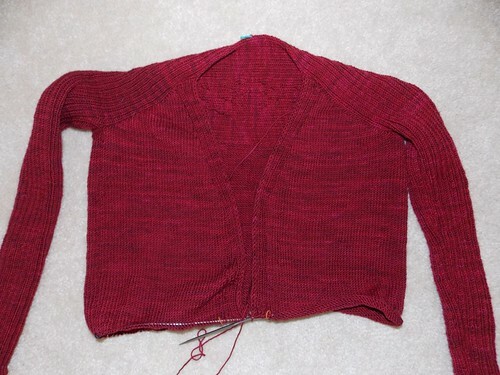 Last night I finished the sleeve/back/sleeve piece for my Retreating Cardigan! My next job is to seam the sleeves, but that's got to wait for a day I've got a little more time. Thanks for all the comments on Logan, I know we aren't the only family going through this, but it's good to hear from others who have been there. Both Bear and Finn loved riding in the car so we're new to this. It's October so there's a new Knit Something of the Month project! This month I am knitting Vlad (fitting for October, no?) in a yarn I overdyed. The yarn is The Woolen Rabbit Kashmir and I think the original color was Oh Ruby. It turned out to be a red with orange/brown undertones though and I just can't wear reds that lean that direction (I have cool undertones in my skin). I overdyed it with a magenta red (cool red) and that swung it just enough to my side of the spectrum that I can wear it! The yarn base is lovely and the original dyeing was beautiful, just not something I could wear. I've got more yardage than the pattern calls for so I'll be working a few extra repeats before I start the edging. In other news, I believe I've mentioned Logan's feelings about riding in cars before, but just to recap, Logan hates riding in cars. He doesn't get truly motion sick, but he gets so anxious that he drools non stop and if the car ride is long enough, he'll throw up. I've tried working with him in the car, but life gets in the way of the time I need to spend with him there and we've never really gotten very far with it. Last Friday I decided to start bringing him on Caleb's morning drop off. It's only 10-15 minutes long, and it happens five days a week. I'm hoping the sheer repetition of it will cut the anxiety. I've been rolling down the back windows in hopes that the smells will distract him a bit from whatever is going through his head. We've only just started this but I'm hoping that eventually he'll realize that he's not going to die, get separated from us, or end up in another country. * He isn't completely shutting down (we have captain's seats in the back and he just goes between them, facing the rear of the car, and lies down) and he is keeping his head up and you can see he's somewhat paying attention to what's going on around him, so that's good, but we've still got a long way to go. This morning, when it was getting close to time to take Caleb, Logan put himself in his crate. *I think Logan's travel issues might come from when he came to be part of our family. He's from Canada and he was 5 months old when we got him (so old enough to remember stuff for more than 5 minutes). I don't know if I've ever told this story, so if I have, ignore it and go about your day. Logan was supposed to fly to us on a direct flight from Toronto to Dallas on the Tuesday before Thanksgiving. This was Thanksgiving 2010. On Monday, the day before, Logan had his first ever car ride to the breeder's vet to get his International Health Certificate. (For those of you unfamiliar with dogs/breeders, it's very common for breeders to vaccinate puppies themselves and not take pups to the vet's office - safer for the puppies and cheaper for the breeder as well - I don't know how many times I've taken Caleb to the pediatrician for a Well Baby checkup and a week or so later we're back with him being sick.) On Tuesday, the breeder drove him to the Toronto airport to send him to us. Unfortunately, that was the Thanksgiving that TSA had a bunch of new regulations (remember the "Don't touch my junk" - these shipping regulations were connected with increased "security" at the airports) and when she had booked his flight with the airline, they hadn't told her she'd need to jump through some additional hoops to do this. This breeder has been shipping dogs all over the world for 40+ years - this wasn't her first rodeo! So she took Logan back home with her. The next day (Wednesday, the day before Thanksgiving, the busiest travel day in the US) she loaded him up in the car, drove him across the border to Buffalo, NY and he got on a plane there. Fortunately, they made it though the border crossing an hour or so before that tightened up security-wise or they would have gotten held up and he could have missed his flight. Unfortunately, he didn't have a direct flight from Buffalo to Dallas - he had to fly through Newark, NJ. Finally, that night we picked him up at DFW where he was exhausted and wobbly but glad to be out of the crate. He didn't even care that a complete stranger opened his crate and reached in to put a collar and leash on him. Of course, that stranger was me and he's totally become a Momma's boy over the last two years, but after all that, I think he has a pretty good excuse for not liking to travel much. I realized over the weekend that this sleeve/back/sleeve piece is pretty much a scarf. It has some increases and decreases and a decorative cable thing smack dab in the middle, but it's pretty much a scarf. Fortunately, I'm still amused by it so it's not a slog - yet. I'm going to keep pushing on it though and get it done before I lose interest. I've started the decreases on the right sleeve part of it, so I am getting there. It also helped to inspire me that this weekend was (relatively) cool and it rained all weekend. Logan sort of enjoys the rain because he likes to try to steal his foot cleaning towels. I don't allow him to play with towels because he can't tell the difference between dog towels and good towels. If I ever get a dog who can tell which towels are the good towels he's not supposed to play with, he can play with his dog towels. So far no one's been allowed to play with towels except for Bear, briefly, who taught me that dogs can't tell the difference. I understand that some men have the same problem.